Kaala is not the Chuck Norris-type, stereotyped Rajinikanth movie. In fact, it is his most accomplished to date – as an actor, who plays by the script – and refuses to grow into the screen avatar we are so used to, unless necessary. That might be a welcome relief for many but might also disappoint the die-hard, pure-play entertainment seekers because Kaala is a lot more than Rajinikanth. It is a grim, often over-the-top, reminder of the schisms that divide India – colour, caste, creed, race and of course, politics and the power that comes with it. It is about land – land that is the only way of life for millions. It even does a mild sermon on fascism – a sort of back-handed slap against the Modi government – whose machinery ensures that dissent isn’t tolerated easily. It also takes a obtuse stab against the two big dreams of ‘Modi’ – of course, camouflaged in the guise of Haridada (played by Nana Patekar), who talks of going ‘digital’ and ‘clean’. Kaala does not necessarily reflect the political statement of Rajinikanth – anything more than his outburst to the media, when cornered on the Sterlite issue. In real-life, he was angrily muttering about the need to stop all this blabber about ‘poraattam’ (fights) – and as reel-life Kaala, he does pretty much the same when confronted by a mob inflamed by instigated communal tension. Perhaps the most compelling sub-text of Kaala is the politics of colour – where black – equated almost on stereotype mode as something to be looked down – is celebrated. It exposes that all that is white and clean need not necessarily mean pure – and in a befitting climax, it is a show of black – the power of black in merry celebration as it triumphs over ‘white and clean’. That said, Kaala does not deprive you of the Rajinikanth you seek. There are fantastically choregraphed action scenes and goosebumps-inducing punchlines. But all that – you can see – is also Pa. Ranjith trying to balance out the super-star and the actor. After all, for a good run of the film, Rajinikanth plays Kaala as the normal man – a man petrified of his wife, a man lost in love, a man who is bowled out by a kid in cricket, a man who takes life’s blows often. Rajinikanth does not get any star-studded entry – he merely turns to you – and that is it – the star is on screen. Where that down-to-earth humanoid Kaala turns into Rajinikanth- the star are in some spectacularly mounted action sequences (where of course a hundred men fly) and ramped up by a background score (by Santhosh Narayan), which in itself is a character in the movie. Kaala dives straight into the evolution of land and its role in today’s power politics before panning into one of the biggest slums in the world, Mumbai’s Dharavi -where Kaala ‘lords’ over his people – without as much as being an underworld don. He is presented much like any other ‘husband’ and ‘father’ – seated by a rather small home, on a wooden chair, in his lungi, sipping a cup of kaappi (coffee). Efforts by Haridada to evict the people and grab the land is the film’s friction point. Added into the narrative is the lost-love of Kaala – Zarina (Huma Qureshi), who was once a Dharavi-resident and is now a globetrotting slum-regeneration expert. However, she doesn’t see through the scam that Haridada is operating until too late. Pa Ranjith makes sure not to rush through the film. After all, he has the glue that holds even a 180-minute long film – the one and only Rajinikanth. So he also focuses on building the magnitude of the villain (as any good director would know). The face-offs between Haridada and Kaala are indeed among the high points of the film – with exemplary dialogue delivery by both – and the friction ripening with every second. Superb act by both actors take these scenes to a higher plane. There are also the side stories of what happens in any household – the unbreakable bond that Kaala shares with his wife Selvi (a fantastic Eswari Rao), a Godfather-like son (Arulnidhi – impressive) ready to die for his father; a to-die-for friend in Anbu (Samudirakani, superb, superb, superb); and Kaala’s youngest son- who is leftist in his views but seems utterly naïve as to rely on the system to make the change. The first half builds the narrative – at times in a testing slow pace – with the second giving way to brisker action – as Kaala fights back at Haridada, who seems to be winning the game. The film’s strengths, apart from the background score and crispy dialogues, include its camera by Murali G; nothing is glossy in Kaala. Everything is as ‘dirty’ as it can get; the grim mood never lets you off the narrative hook. Sreekar Prasad, as editor, does an inspiring job; you can in fact feel the rhythm of the film in his cuts. 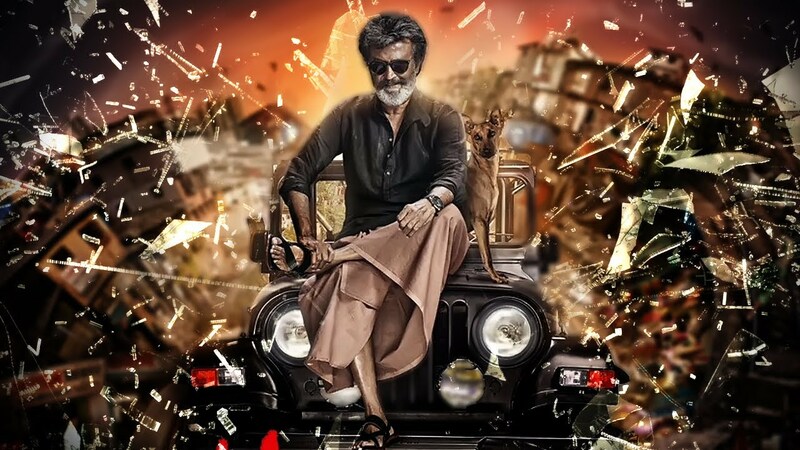 Rajinikanth, no doubt, does an outstanding job; you do not see Rajini – and that is saying a lot – because he transforms into Kaala. Kaala does not traverse film-narratives that others before haven’t said before. Mani Ratnam and Priyadarshan, from south cinema, have travelled the route – but where Pa Ranjith scores over them (yes, over them) is in making a film that is honest and conveys a political statement that needs to be drummed into our collective conscience today. Yes, there are cinematic excesses; there are strands of illogical goings-on; you can come up with mistakes and reasons to frown, but as cinema, as a medium that connects you, me and the everyday man with cinema, Kaala scores hands-down. Post-note: it must seem ironical that a Maratha (Shivaji Rao Gaekwad) had to morph into Rajinikanth to depict the south Indians and more – the marginalised people who live in the slums of Dharavi – to present a strong take on India’s big divides. But yes, that is the magic of cinema – and that is the marvel of Tamil cinema, which is perhaps the greatest leveller – other than death – that discriminates none or anything.